TV streaming boxes are like buses it seems. Nothing much happens for months, and then you get two high profile launches at once (potentially three if rumours of an imminent new Roku streamer also turn out to be true). First there was Apple, which finally launched its new Apple TV box on September 9th - the best part of three years after it launched its previous one. Then just seven days later Amazon, with delicious timing, launched the second generation of its Amazon Fire TV box. Having both new products unveiled in such close proximity to each other highlighted what looks set to become a much more intense direct rivalry between these two high profile TV accessories - as well as affording us the chance to make some pretty direct comparisons between what each will offer ahead of their on sale dates in the coming weeks. So let’s have a look at some of the key similarities and differences between the two streaming box’s features according to the information that’s been released so far. Amazon’s box gets off to a flier in this section by offering support for 4K UHD streaming while Apple’s new box is limited to full HD resolution. For those of you not familiar with 4K UHD, it’s a new picture format that delivers four times as many pixels as full HD - and as you might expect, it’s capable of giving hugely superior image quality. With 4K UHD TVs available at a huge range of sizes and price points now, and more 4K content sources appearing almost daily, Apple’s refusal to include 4K support in the new Apple TV seems like a major oversight. Especially as Amazon has been able to offer it in a box that actually costs considerably less than the new Apple TV (more on price later). Apple could defend itself by pointing out that there are considerable hurdles to streaming 4K UHD, such as the need for at least 15Mbps of broadband speed into your home, a relative shortage of 4K UHD content versus HD and standard definition, and even potential issues (based around unresolved royalty costs) with the HEVC compression system currently being used by the main 4K content providers. Plus, of course, people will need to own a 4K UHD TV to see the streamed 4K pictures. However, if offering 4K UHD is so easy Amazon has been able to do it in a box that costs under $100, why not just throw it in as a bonus on the Apple box too? Especially when during times of radical change in the technology world one thing consumers tend to respond positively to is future proofing. It’s not clear at the moment if the new Amazon Fire TV box will also support streaming of the growing number of high dynamic range shows on offer via Amazon’s Prime and Instant video streaming platforms. 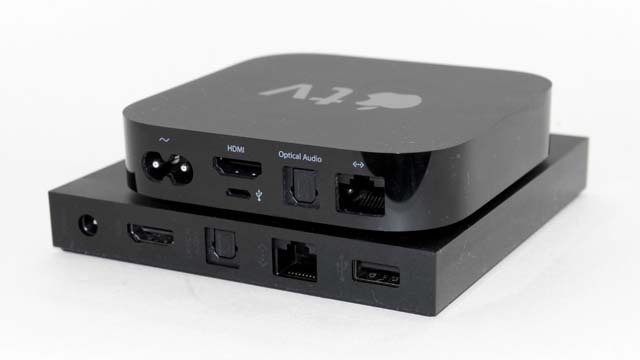 Both new TV boxes use 64-bit processors - a quad-core MediaTek chipset in the Amazon Fire TV, and an A8 chipset in the Apple box. There’s a definite difference when it comes to the built-in memory each box carries, though, and initially it seems to go in Apple’s favour. Apple is offering two Apple TV versions, one with 32GB of built-in memory, one offering 64GB of built-in memory. The new Fire TV, by comparison, only manages 8GB. However, the Fire TV handily carries a microSD card slot you can use to add up to 128GB of extra storage. Though of course, buying a large-capacity microSD card if you end up needing more than 8GB of internal memory will add to the effective cost of Amazon’s box. As you’ve probably guessed by now, the new Amazon Fire TV box is substantially cheaper than either version of the ‘new Apple TV. It costs just $99.99, while the 32GB Apple TV costs $149 and the 64GB costs $199. Though you will nudge the ‘all-in’ cost of the Amazon box up if you decide to add enough storage capacity to bring it up to a level that rivals what you get with the new Apple TV. This one will be hard to call definitively until we’ve got both boxes hooked up to a TV. And it’s also an area where the playing field can change continuously as more apps are added. In sheer app number terms Amazon Fire TV initially looks likely to have the edge; Amazon claims its Fire TV platform now supports upwards of 3,000 apps - a 17-fold increase on the number available when the original Fire TV launched. However, unlike its predecessors the new Apple TV can use standard iOS apps that work across other Apple devices like phones and tablets. Making Apple TV a more integrated part of the Apple family in this way will instantly lead to a huge increase in the number of app options available to it - as well as making it even easier to share content between all your Apple devices. It’s worth remembering, too, that Apple is purportedly working on a TV streaming platform of its own to rival that offered by Amazon, so if Apple can do a good job with that in content and interface terms it could become a significant draw for the Apple box. I’ll need to use both boxes for a few days to be sure which one will come out on top in this section. However, from what’s been revealed so far, while the previous Amazon Fire TV was certainly slicker to use than the old Apple TV, Apple appears to have made the biggest moves forward with the new Apple TV. In fact it’s developed a completely new tvOS operating system that looked during Apple’s launch demos to be much more intuitive, inviting and slick than the previous Apple TV menus, finally introducing a touch of the usual Apple OS ‘magic’ to the one product in Apple’s line up that’s always previously felt a bit peripheral to Apple’s ecosystem. Making sure the new Apple TV can share apps across platforms with other Apple devices has clearly played a big part in the Apple TV OS revamp, but at the same time Apple seems like it may have customised the Apple TV interface enough to avoid the common smart device mistake of just trying to shoehorn a smartphone or tablet interface into a TV environment. Apple has also attempted to improve the experience of using the new Apple TV box by introducing a fairly radically redesigned remote control, which sports a thumb-swipe touch pad on its upper end, and carries a built-in gyroscope and accelerometer so that you can use it like a Nintendo Wiimote for gaming applications. The new remote is rechargeable too, delivering up to three months of use from a single charge, and communicates with the Apple TV box via Bluetooth so you don’t need to be pointing it directly at an Apple TV IR sensor. As if all this wasn’t innovation enough for the new Apple TV OS, it also introduces Apple’s Siri voice recognition system. This will of course come in handy for speeding up searches for content, but Apple seems to have introduced some more innovative features for it too. For instance, say ‘What did he say?” and Apple TV will rewind what you’re watching for a few seconds so you can see it again. Personally I’m pretty sceptical about voice control in a TV environment, but maybe the new Apple TV will be the product that changes my mind. At which point it’s high time I pointed out that Amazon hasn’t just been sitting around twiddling its thumbs over the past 12 months. Its ramped up operating power should make its already slick OS run even better, and Amazon has also introduced a significant voice recognition system based on the Echo system. This won’t be available at launch; it’s due to be uploaded via a free upgrade next year. But if it proves as effective as it is on Amazon’s ground-breaking voice-operated Echo speaker/computer gizmo then it will likely be a strong rival for Siri’s efforts. Unexpectedly and perhaps controversially, both Apple and Amazon are keen to push the gaming credentials of their new streaming boxes. Amazon is even offering a Gaming Edition version of Fire TV for $140, which includes a games controller, 32GB microSD card and two games alongside the main Fire TV box. The new Apple TV tries harder to be a gaming device directly out of the box, especially with its innovative new remote control. This potentially goes some way to justifying its price hike over the Amazon Fire TV. However, the gaming potential of both new boxes is essentially app based; essentially playing apps you can play on your phone or tablet on your TV instead. Personally I’m not convinced many people will really want to do this, so at this point I don’t see either the new Apple TV or the new Amazon Fire TV taking on the traditional console market to the extent some pundits had speculated/hoped they might. Though I’m open to having my mind changed if either streaming box comes up with some killer gaming app that feels more at home on my TV than my phone. Both the new Amazon Fire TV and Apple TV boxes deliver some significant steps forward from their previous incarnations. Apple seems to have focussed primarily on improving the interface of its new TV box and making it a more integrated part of a wider Apple eco system, while Amazon scores a major coup over its arch rival by supporting 4K UHD video streaming. Personally, given that I’m a huge fan of the 4K UHD experience, Amazon’s 4K move makes it feel to me like the more future-proof option right now - especially as sales of 4K TVs are increasing exponentially year on year. But there’s every chance Apple could wrestle back the advantage once I’ve got both boxes hooked up to my TV, so look out for a full reviews of each box in the coming weeks.